Continuing the debate on the value of U.S. FONOPs, Sam Bateman responds. 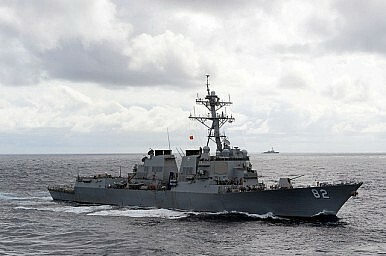 Jonathan Odom’s lengthy critique of my writings on U.S. freedom of navigation operations (FONOPs) in the South China Sea reminds me of Ken Booth’s famous statement in his classical work Law, Force and Diplomacy at Sea, that “the changing law of the sea is too serious to be left to international lawyers.” This is especially the case with serving military lawyers whose job it is to defend their country’s position. While I will take Commander Odom to task on some legal issues he raises, my main concern with his critique is the lack of attention to the political and strategic implications of the recent U.S. FONOPs. What Is the Purpose of the FONOPs? I stand by my claim that the purpose of the U.S. FONOPs is unclear. This view has been reinforced recently, by the several commentaries pointing out that confusion surrounds just what the U.S. was trying to achieve with its FONOPs in the South China Sea. These operations are starting to look somewhat clumsy and hardly worth the trouble that they are causing, including for the image of the U.S. in the region. As commentators have pointed out, steaming inside 12 nautical miles of a low tide elevation that should only have a 500 meter safety zone and claiming it as innocent passage risks being de facto acknowledgement of China’s claims. The implication is that it may have been better to go the full distance and go right in, conduct weapon practices, operate helicopters, and so on, simply to demonstrate that it was not innocent passage. But of course, the U.S. is unlikely to do that. There are significant political downsides to what the U.S. is doing in the South China Sea. Apart from the deliberate provocation of China, unequivocal support for American actions has only been shown in the East Asian region by the Philippines. Other countries are concerned about the downward spiral of trust between the U.S. and China in the South China Sea. In the worst case scenario, they are fearful that if current trends continue they will be forced to take sides. Indonesia has strongly criticized the FONOPs, Japan has declined to participate, and Singapore has been ambivalent. Even Australia, as Washington’s loyalist supporter in the region, has backed off from joining the FONOPs. While the U.S. claims to be not taking sides in the sovereignty claims, its FONOPs in the South China Sea send a political message that can easily be misconstrued. The USS Lassen may also have steamed past features claimed by the Philippines and Vietnam, but China was clearly the target of its operations. That is how most people in the region see it. It is unfortunate that in the streets of Beijing, Hanoi and Manila, the U.S. is believed to have taken sides. In this way, U.S. engagement in the South China Sea has had the unfortunate consequence of boosting nationalistic fervour in all three capitals. In his purely legal approach, Commander Odom does not recognize the security dilemma that has emerged between the U.S. and China. This is characterized by strategic distrust and an apparent action–reaction dynamic in which initiatives on one side are being driven by the actions of the other. The U.S. FONOPs have only fuelled this security dilemma and added to the militarization of the South China Sea. I agree with Commander Odom that China should clarify what it means with the U-shaped line. I have said so in several recent papers, including ones delivered in China. However, my interpretation of what the line means is based on a fair appreciation of the facts. It is much more than the mere speculation – or the presumption suggested by Commander Odom. Geographical shorthand was appropriate because at the time when the U-shaped line first appeared, we did not have the luxury of satellite information, and there was no good knowledge of what features existed, particularly in and around the Spratlys. There are precedents for such a geographical shorthand of defining a claim, notably Philippines’ long-standing “picture frame” claim to maritime rights based on the Treaty of Paris, and a similar approach used by the Maldives for many years to define a maritime claim. The possible geographical shorthand interpretation of the U-shaped line was also recognized by the U.S. State Department in its study examining China’s Maritime Claims in the South China Sea in its Series, Limits in the Seas No. 143. This study noted that “It is not unusual to draw lines at sea on a map as an efficient and practical means to identify a group of islands.” It went on to observe that “Support for this interpretation can be found in China’s laws and statements,” and concluded that setting aside issues related to competing sovereignty claims and unresolved maritime boundaries in the South China Sea, and if this interpretation of China’s dashed-line claim is accurate, “then the maritime claims provided for in China’s domestic laws could generally be interpreted to be consistent with the international law of the sea.” Admittedly this conclusion was subject to several caveats, but my general point holds true that there is nothing intrinsically wrong or unlawful in the “geographic shorthand” approach. The position that the line is not an ambit claim to the waters of the South China Sea is further supported by the extent of the activities that have occurred inside the line that have not been protested by China. These include the maritime boundaries agreed between Indonesia and Malaysia, Indonesia and Vietnam, and Malaysia and Brunei, all of which intrude some considerable distance inside the 9-dashed line. Also, Brunei, Indonesia, and Malaysia all have oil and gas developments inside the line in the southern part of the South China Sea that have not been formally disputed by China. The U.S. is not acting judiciously in the South China Sea. While not a party to UNCLOS, it is not backward in preaching its interpretation of key provisions of the convention to regional countries. However, it also appears to ignore important features of the exclusive economic zone (EEZ) regime, the sui generis nature of which is so important to regional countries. It also fails to support Part IX of UNCLOS, and the exhortations therein to the littoral countries of the South China Sea to cooperate in managing the sea and certain activities within it. Commander Odom acknowledges that I have accused the U.S. of “turning the clack back on UNCLOS,” but then totally fails to address my key points – the failure of the U.S. to more specifically acknowledge the “due regard” requirement when conducting military activities in another country’s EEZ, and the full significance of the coastal State’s jurisdiction over marine environmental protection and marine scientific research. This might have been possible, for example, in the recent authoritative report by the Congressional Research Service (CRS) on the maritime territorial and EEZ disputes involving China, but strangely the report did not address these issues. Hence an important opportunity to better inform members of the U.S. Congress was lost. American commentators continue to talk about the South China Sea as “international waters” or as part of the “global commons” or the “maritime common.” They are not. Rather they are parts of the EEZs of one or another of the bordering countries, which have significant rights and duties in such waters that need to be respected. Even Subi Reef, the target of the recent FONOPs, lies within the possible EEZ of Thitu Island, one of the larger features in the Spratlys and most probably entitled to an EEZ. I am aware that nothing has been claimed in this regard, but that is not the point. The U.S must start acknowledging more fully both the sui generis nature of the EEZ regime and the need for the bordering countries to the South China Sea to cooperate under Part IX of UNCLOS dealing with enclosed and semi-enclosed seas. The U.S. opposed this Part when it was being negotiated, and it looks like it still does. The latter failure is a great pity as the U.S. has great skills and experience to assist regional countries with their cooperation. Commander Odom suggests that the legal debate about U.S. military activities China’s EEZ is over, but I don’t think he should be so complacent. Neither the legal debate nor the political debate is over. I accept the premise that military activities in an EEZ in a general sense are part of the high seas freedoms available in another country’s EEZ – but there are two major qualifications: They must be conducted with “due regard” to the rights and duties of the coastal state, and they should not involve marine scientific research. Regrettably, Commander Odom in his recent critique fails to acknowledge this jurisdiction of the coastal state when he refers only to resource-related “sovereign rights.” All this looks suspiciously like the arguments the U.S. used when the EEZ regime was being negotiated. There is a close intersection between international law and politics. At the end of the day, it is politics not the law that will resolve many disputes we see with the law of the sea, including matters of sovereignty and boundary agreements. It is also politics that condition the evolution of the law of the sea, including the freedoms of navigation. After all, just over 30 years ago, Australia, the U.S. and others were still regarding the Java Sea as “high seas.” But now they are under the full sovereignty of Indonesia, which robustly defends this sovereignty, even by declaring an ADIZ over them. All this just shows how the excessive claims of yesterday can become the customary law of today. But it is of course this advance of the law that the U.S. is seeking to oppose with its FONOPs program. In the final analysis, all this “lawfare” and “war of words” over FONOPs in the South China Sea, and the maritime claims there more generally, is not helpful. It is leading nowhere other than down the path of increasing distrust, misunderstanding, and regional instability. As Lyle Goldstein has written in his recent book Meeting China Halfway, what we need in the South China Sea is a “cooperation spiral” rather than the current “escalation spiral.” The cooperation spiral is not just a requirement – it is also an obligation. Unfortunately Commander Odom, along with some other recent commentators, fails to accept this basic reality. Sam Bateman is an adviser to the Maritime Security Program at the S. Rajaratnam School of International Studies (RSIS), Nanyang Technological University. We’re entering a new phase in political signaling by China and the U.S.